On first blush, a truck accident case may seem very similar to an accident involving other types of motor vehicles. However, after the initial impression, semi truck accident cases are significantly different in that they commonly result in more damage and more significant injuries due to the sheer size and weight of these vehicles. Trucking accident cases also differ from auto accidents because of the corporate entities involved. Unlike a car accident case where a settlement is usually achieved between the insurance company for the individual who owns the vehicle, commercial truck accident cases commonly involve corporations. These corporate entities recognize the exposure they face when a person is seriously injured or killed by a truck that they operate. Attorney Jonathan Rosenfeld has decades of experience representing individuals and families in Illinois truck accident cases involving serious injury or death. 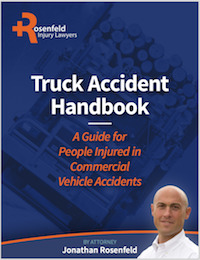 In response to clients' requests, Mr. Rosenfeld has authored a book, Truck Accident Handbook: A Guide For People Injured in Commercial Vehicle Accidents. In the book, Mr. Rosenfeld breaks down the laws applicable to the trucking industry and how they apply to your situation. He will explain why truck accident cases need to be addressed differently than auto cases. For an injured person, he provides tips on how to maximize the value of your case. After reading this book, you will be in a better position to understand your legal options for filing a truck accident lawsuit. You will also, have a better understanding of what to look for when hiring a lawyer to help you with your case. Do You Have Questions or Would Like a Consultation Regarding Your Case? We appreciate the fact that there is no way to prepare for a trucking accident. Our law firm works hard to take the pressure off of you in the time following an accident so you can focus on your physical and emotional recovery from your injuries. 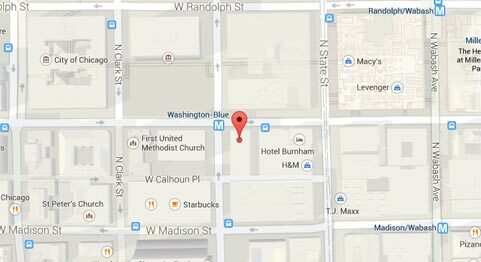 We invite you to contact our office today for a free consultation with an Illinois truck accident lawyer. As with all of our accident-injury cases, we work on a contingency fee basis where a legal fee is only earned when we are successful on your behalf.